The truth is getting ever more inconvenient for Al Gore. 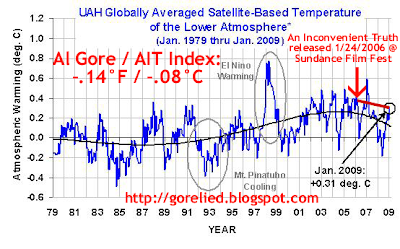 Once again, as we do each month, GORE LIED has taken significant liberties with Dr. Roy Spencer’s monthly UAH globally averaged satellite-based temperature of the lower atmosphere. We’ve marked it up with a red marker to more fully illustrate the really inconvenient truth – that temperatures have dropped significantly, .63°F (.35°C), since Al Gore released his science fiction movie, An Inconvenient Truth at the Sundance Film Festival on January 24, 2006.
of error in ground-based data one is led to the usual suspect, the urban heat island effect. 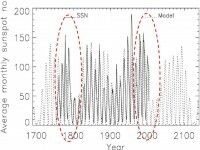 Fatal computer errors in IPCC climate models derive from the fact that none of the abrupt warmings and coolings on the record, especially since 1998, can be attributed to the greenhouse effect. Hence, all IPCC models purporting to predict (project??) climate a hundred years into the future are invalid and their predictions/projections must be discarded. To summarize: existing theory used by the IPCC can neither explain the observed climate nor predict the future. Carbon dioxide warming has been shown to be non-existent in the eighties and nineties, and the warming since 1998 is not carbonaceous in origin. It follows that Quijotic carbon dioxide policies like the Kyoto Protocol and the cap-and-trade laws should be abandoned. See post here. 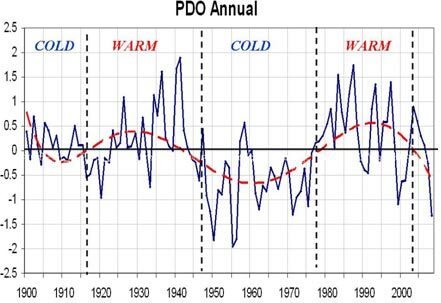 GORE LIED has been tracking the globally averaged temperatures since Al Gore’s science fiction movie, An Inconvenient Truth was released. 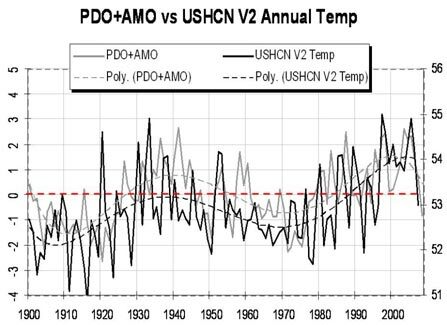 As we do each month GORE LIED has marked up in red Dr. Roy Spencer’s UAH Globally Averaged Satellite-Based Temperature of the Lower Troposphere monthly report, to show in vivid color Gore’s real inconvenient truth. Globally averaged temperatures have dropped approximately .14°F (.08°C) since An Inconvenient Truth was released. That’s not all, a quick glance at the graph shows globally averaged temperatures have remained below the January 24, 2006 benchmark (when Gore’s movie was released at the Sundance Film Festival) except for the first few months of 2007. Taking a Time Machine Ride Back to the 1960s or 1800s? There are signs our weather is taking a time machine ride back to the regimes of the 1960s or even the late 1700s early 1800s. Our climate operates in cycles, which favors different regimes of weather. We have come out of a few decades that thanks to a warm Pacific resulted in a dominance of El Ninos and its typical southern storm tracks and warm, dry western North America. The Pacific has cooled and now favors La Ninas, which have dominated the last two winters. This has resulted in a more northern storm track (and as we reported in earlier stories (here and here and here), record monthly or seasonal snows). The Atlantic is cooling too. The AMO has declined from its 2004/05 peak. 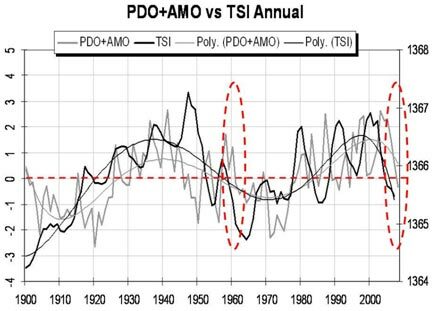 The sum of the PDO and AMO we have shown correlates well with US annual temperatures. In earlier reports, we have shown how the solar cycles also have a profound affect on climate (for example here and here). An active sun through direct and indirect factors leads to warming oceans and through them the land, and a quiet sun to cooling of oceans and land. 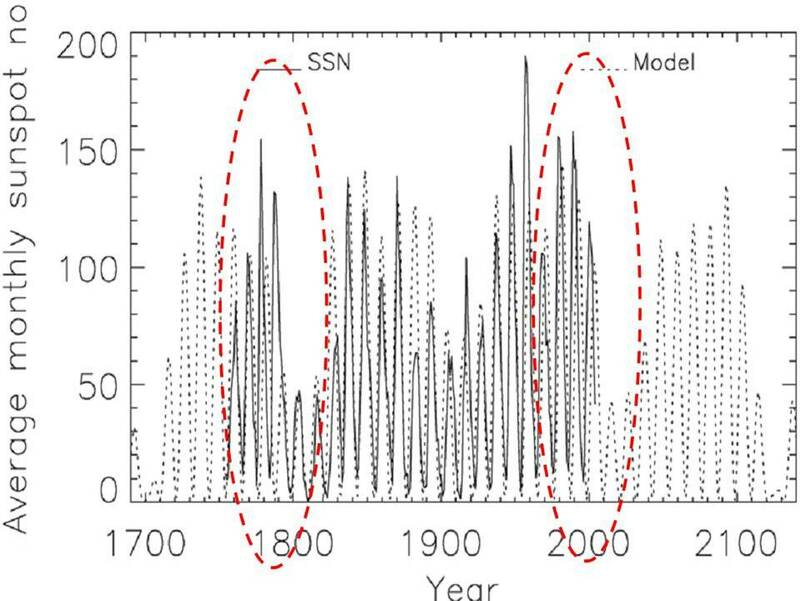 In the last century, we are with the cooling of the oceans, and a quiet sun most like the 1960s (graph below), a cold era as shown in the graph above. 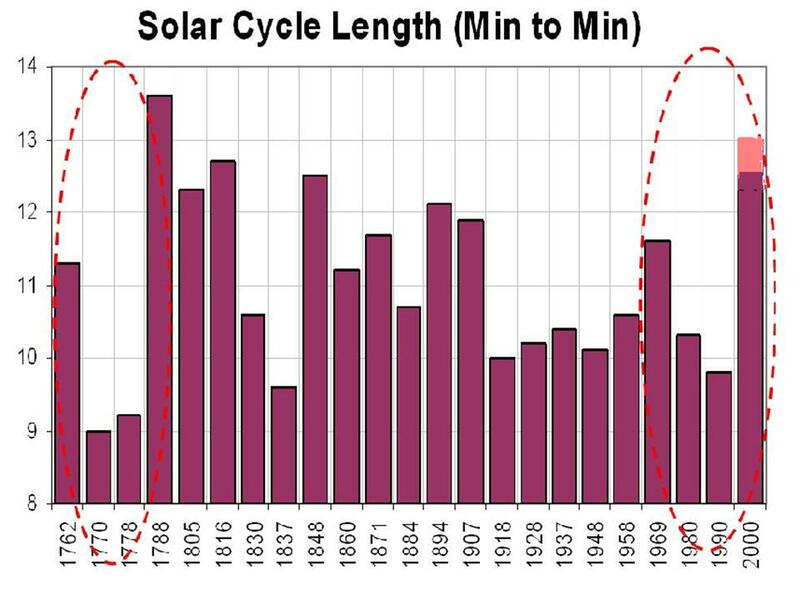 Longer term the sun is behaving like it did in the last 1700s and early 1800s, leading many to believe we are likely to experience conditions more like the early 1800s (called the Dalton Minimum) in the next few decades. That was a time of cold and snow. It was the time of Charles Dickens and his novels with snow and cold in London (hmmmm). 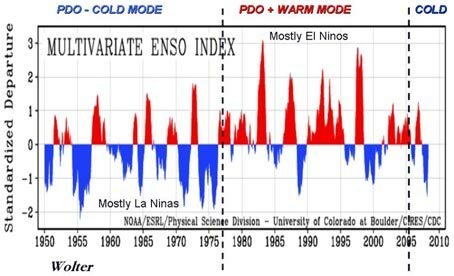 During these cold modes, more La Nina winters like this occur, El Ninos occasionally develop, tend to be briefer and weaker and thus colder and snowier than the El Ninos of the warm eras. If a major volcano occurs, the cold deepens. See the complete story as posted on Intellicast here.